This site is to give you ideas for customizing your XJ Jeep Cherokee. This web site is about what I have done to my 1995 XJ Jeep Cherokee from white background gauges to custom front and rear ARB bumpers and everything in between. For Jeeps are built, not bought! Specification page where you will find details on its final development before it was sold. Exterior page contains details on: all things fitted to the Jeep like bumpers, breather, intake hose, bonnet gas strut, tyre & bike carriers etc. 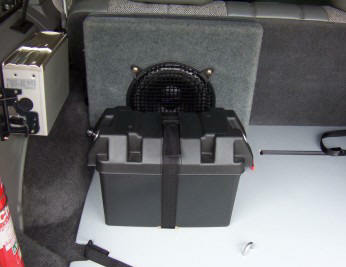 Interior page has details about: white background gauges, subwoofer, extinguisher, CD stacker and CB. 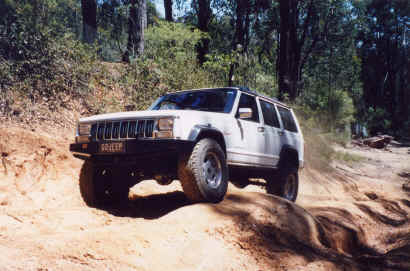 Links has sites of some Australian Jeep Clubs and other forums. 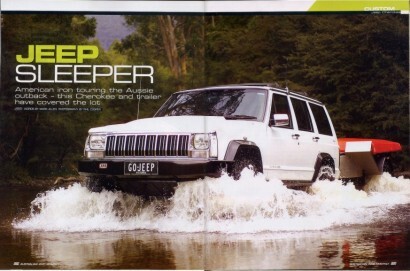 Photos have two pages of shots of my Cherokee's in different offroad locations around Australia. Trailers page has information about the offroad trailers I have built with one having XJ suspension. Full plans available as well. Trip Reports Trip Reports has details and pictures of the trips around Australia in the XJ. White Gauges shows how to change the blacks gauges to white backgrounds for $10. My Model XJ Jeep Cherokee and Willys Truck Collection. Australian No.4 Army Trailer partial restoration. Latest custom ARB bumper with hitch. My custom ARB front bumper. My custom ARB rear bumper. Custom ARB bumper with a class 3 hitch. Roof rack lights and deflector. All steel replacement Cowl Bonnet/Hood. Cut the front guards like late model XJ's. Cheap flares extensions for tyre coverage. Trimming the rear wheel arch. Raising the front of the skid plate. MJ with Beijing front with 01 running gear/interior. Swapping to 97+ front panels and bumpers. Extended swaybar brackets for OTK steering. Raised Trackbar axle mount for OTK steering. Raising the steering with a OTK flip. 38% larger tie rod up-grade. Making your own steering box brace. Fitting front control arm drop brackets. Installing WJ lower control arms. Using a extra main leaf for lift and stability. Fitting a Rancho Add-a-leaf to the rear springs. Making and fitting a rear leaf spacer. Airbag rear suspension tips for lifted installs. Lift without changing springs or using blocks or longer shackles. Leveling the front with OME coil comparison. Make you own transfer case spacers. Raising the rear shock mounts. Do your own wheel alignments. Changing over to an electric 16" fan. Fitting a 4500 CFM Ford Taurus Fan. Larger transmission cooler behind bumper. Improved cooling with high flow water pump, thermostat & housing. Adding a restrictor to improve cooling and stabilize temperature. Making a deep automatic transmission pan. Work out the right Speedo gear and how to fit it. Fixing the reverse light, park and neutral switch ( NSS ). Making a new tray for a bigger battery. Staying in second gear and locking the torque converter. Converting to Bi-Xenon Projector Headlights. Red and clear taillights fitted. Fitting a factory dash clock. Fitting of a trip computer. Mounting CB's and how to run the cable from roof to inside. Installing a new engine 4.6 stroker. Swapping to a late model intake. Custom yoke style SYE for 242 or 231. Installing a throttle body spacer. Boring your own throttle body. Installing a D44 and setting the angle for a SYE. Adding an adjustable fuel pressure regulator. 4 piston SRT Brembo Conversion. Big rotor and twin piston calipers for the front axle. Ford Falcon BA rear disc conversion. Ford Territory 13" Rear Ventilated Disc Conversion. Converting to rear disc brakes using EA Ford Falcon parts. EA Ford Falcon Disc Brakes on a D44 axle. Rear brake line extension bracket. Swapping to a ZJ proportioning valve. Front brake pad and or rotor change. Fitting a Diesel Airflow snorkel. Cold air induction for stock airbox. Heat shielding for intake and airbox. Adding a stainless steel gauge surround. Carbon Fibre dash film fitted. 32" spare fitted in stock location. Removing the auto button indent for forward gears. Fitting a 97+ Shifter for better reach. Changing the auto shifter and transfercase handles. Fitting a cargo boot liner. Information on how rear head rests are fitted. CPS/CKS/CAS replacement to cure engine cut outs or no starting. Changing the axle seals on the front D30 axle. Major service items, brake, power steer fluid change plus fan belt. Replacing the rear main seal. Strip and clean for mud effected starter motor. Replacing the O rings in the oil filter adaptor housing. Change your own diff oil and fitting an alloy cover. Replacing a tie rod and or boot. Replacing a axle seal in a Dana 35 rear axle. Changing your transfer case output seal. Balancing your tyres with beads. Fitting a long range tank. Getting more fuel into a standard tank. Setting the right tyre pressures for different sizes and loads. How a snorkel is manufactured. How a custom radiator is built. Stopping the axle vent pumping oil. Shade cloth as a window tint for your rear windows. Making your own offroad trailer coupling. I have owned a number of four wheel drives in the last 30 years from a Toyota Hilux with a 400 Chev and 3 foot tall tyres to a Jeep CJ7 with a 351 Windsor V8. I am always modifying what I own to get exactly what I want and enjoy doing so. The Cherokee is the first one that I have not had to do any engine transplants to get the power and economy that I wanted. It was one of the reasons I chose this vehicle in the first place. The Jeep has a good power to weight ratio being of unibody construction which has saved around 500 kilos in comparison to other four wheel drives of similar size. Having four doors was also a priority with a small family and a Japanese Akita, to fit in. The Jeep is mainly used for touring around the Outback of Australia and I have racked up over 120,000 km on holidays in the last ten years going around the country and crossing it in a number of directions. I have done this using an offroad trailer that I built with independent suspension with an offroad coupling and a roof top tent on the Cherokee. This suited us with our short stops everywhere but with most places now seen we intend to spend more time along the way and set up a base camp to explore from. This could not be done before as we had to pack up the roof top tent before we could move the car. I now use tent trailer that was built to meet my particular needs using a set of Jeep's up-country rear leaf springs, shock absorbers and wheels for it ( see trailer page ). All things shown or advice given on this site is to give you ideas of what can be done. They may not be suited to your vehicle, or your level of skill or even legal in your state or country. You assume all responsibility for any modifications that you make to your vehicle, and must understand the consequences of each modification you make. I cannot be held responsible for your interpretation of these articles, or your implementation of these modifications. It is up to you to make sure anything shown needs engineering approval or advice before using it.